You can’t find a good substitute for a solid LCR meter. With the most basic unit, an LCR meter will measure inductance, capacitance, and resistance. But depending on your selection, LCR meters can provide detailed information about impedance, dissipation factor, quality factor, phase angle, or even equivalent series resistance. It all depends on what you need to know. It would be easy if every electronic device was made exactly the same way. But since that’s not the case, and different electrical components use a huge variety of different form factors, you’ll inevitably need different types of leads or fixtures to help connect with an LCR meter. Some meters will provide more options than others. Accuracy for LCR meters is mostly about choosing between analogue and digital. Analogue components tend to be much cheaper, but digital components tend to provide much better accuracy. 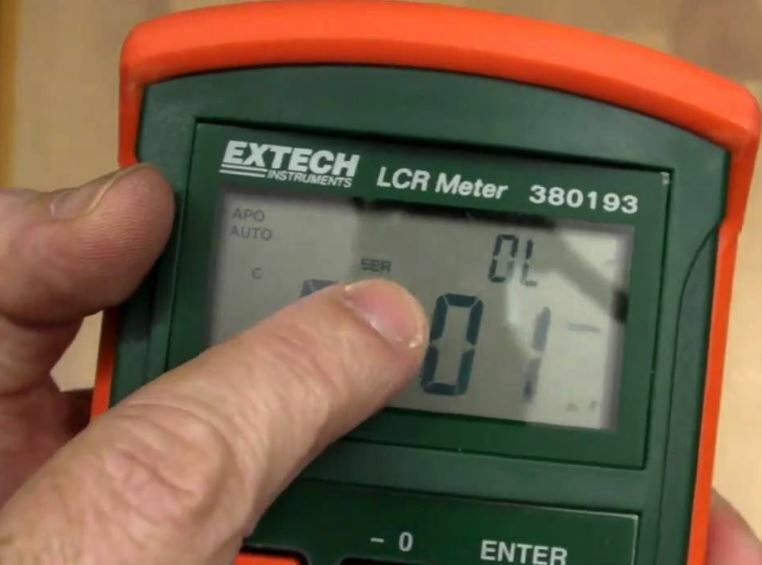 Electricians might use an LCR meter to test frequencies between 100 to 10,000 Hz. For other types of applications, you can find instruments which perform within accuracy within less than 1% variance. But if you don’t need precision accuracy, you can save a few bucks by going with an instrument which is accurate within a few percent. How often are you using the instrument? When you’re only taking the occasional measurement, some details become less important. For instance, digging through menus to find a function you use on a regular basis? That’s not so bad if you’re only using the meter from time to time. But when you’re using the LCR meter on a regular basis, having to dig through menus can be tedious and inefficient. Seemingly small details like that can become a huge issue for people who expect to have regular contact with their meter. Most of the best LCR meters will have some kind of onboard data storage. But how many data-points can be stored? Do you only keep basic readings, or can you keep the analysis you’ve done with the data? How about moving the data off the instrument and into a PC? Many instruments come with included PC software, but it’s not always easy to use, and it’s not always compatible with every type of operating system. Anytime you’re working with a handheld instrument, and especially if there are batteries involved, it’s worth taking a moment to think about longevity. Because people tend to drop things. What happens when your LCR meter takes a fall onto solid concrete? Are there any grips on the device to help reduce the chances of that happening? The Extech 380193 happens to be pretty popular among manufacturing facilities, especially with quality control departments. From a functional standpoint, this meter is great for validating a wide range of different components. 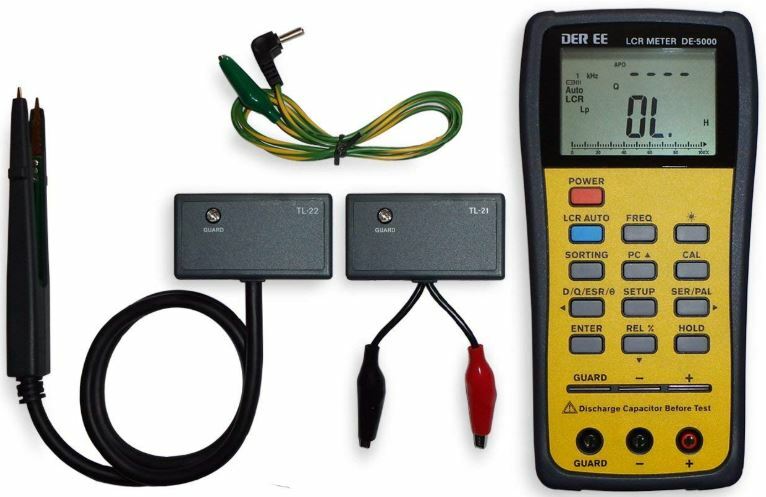 Unlike an ordinary digital multi-meter, this LCR meter delivers levels of accuracy otherwise impossible with the benefits of inductance, while also testing between 122.8Hz and 1kHz. When you’re doing circuit testing, the Extech 380193 lets you test a huge range of different parameters, quality factor, resistance, and dissipation factor. Two types of modes are available, parallel and series mode. Each provides different opportunities for various levels of throughput, too. The 380193 measures 7.6 x 3.6 x 2.1 inches, and weighs just under one pound. That’s fairly compact, though a little bit weighty. The green and orange chassis may not win any beauty contests. But if you can allow yourself to lose sight of aesthetics, there’s really no denying this is a highly portable instrument. The least portable part of its design is actually the fact it’s a corded electric instrument. So even though it looks like you should be able to shove some AA batteries inside, you need to connect power from the front terminal. The top of the instrument is constructed with a 4.5” backlit display, which roughly resembles the display of a calculator. Notably, this display is actually composed of two levels. The bottom portion makes up the majority of the screen, and it provides a large space for giving a readout of your primary measurements. And the top quarter of the screen is dedicated to a separate row of digits, letting you keep an eye on quality factor, resistance, or dissipation values. Similar to a calculator, the Extech 380193 includes an averaging feature. It’s labeled on the device with a “MIN MAX” icon. It will average your page 3,000 recorded data points and then provide an average for you. The Extech 380193 includes a PC interface as well. You can print, store, export, or view data collected by the instrument for any variety of data manipulation tasks. For instance, you might export your data and begin turning it into graphs. The accuracy is within ±4Hz on both the top end and bottom end of the measurement scale. The open and short function can help remove stray parallel impedance from your measurements. 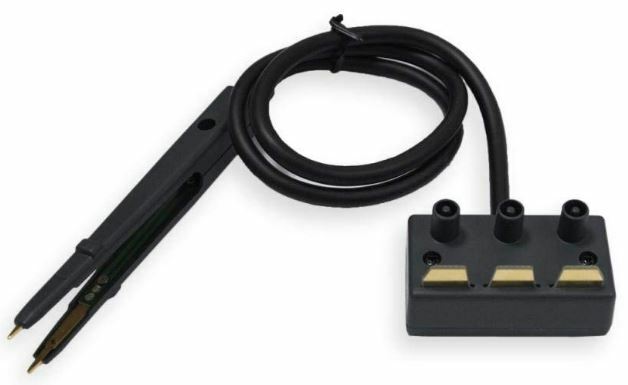 That helps to boost accuracy to new levels, and it helps provide support for very low impedance. 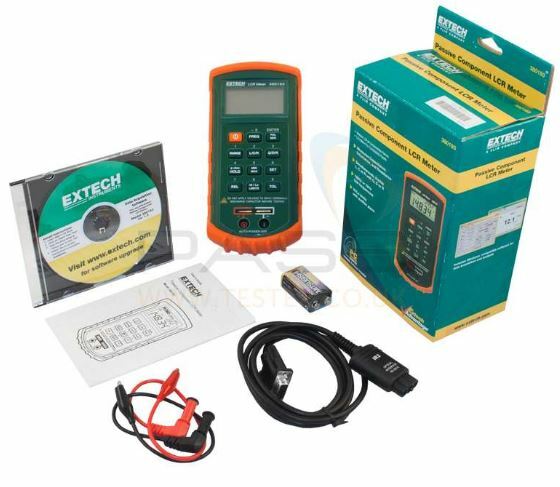 Though few extras are included with this kit, Extech does include a one-year warranty with the 380193 Passive Component LCR Meter. For people who are concerned with DC resistance measurements or AC impedance measurements, the DE-5000 is capable of fully automating a wide range of different testing operations. That way, you can measure LCR components using the automatic LCR mode, and without having to ever navigate through special function keys. Moreover, the DE-5000 has a pretty wide range of added capabilities. It can measure capacitance, inductance, and resistance alongside other parameters like quality factor, phase angle, dissipation factor, parallel resistance, and equivalent series. For taking one measurement after another, using this meter can feel pretty smooth. The DE-5000 measures 3.7 x 7.4 x 2.1 inches, and weighs just under one pound. In order to operate it, you have to stick a 9V battery inside. The chassis is primarily dark gray, except the front, which uses a yellow faceplate to help provide high contrast for the labeling of each analogue button. For an instrument that doesn’t provide digital buttons or something fancy like that, the faceplate is a nice touch. Most of the analogue interface is pretty self-explanatory. The power button will turn on or off the DE-5000, the sorting button will launch the sorting feature, and so forth. That leaves you plenty of time to spend focused on the display. And the is actually pretty large, nearly twice the size of the display used by the Extech 380193. Similar to Extech’s instrument, the DE-5000 divides your data into two tiers. The top layer provides information about your input settings, while the majority of the screen is dedicated to giving you the latest data readings. Also similar to the Extech 380193, components can be measured in either serial or parallel mode, depending on the device you’re testing. If you need to get a bit more hands-on in your testing, users can choose between 100Hz/120Hz/1kHz/10kHz /100kHz testing frequencies. You can also use the included sorting mode to help make a quick data collection from several components you’ve measured. The DE-5000 includes a DC 9V battery, SMD tweezers case, guard line case, alligator test lead case. You can also get an optional IR to USB case, but one is not included. The power adapter is not included, either. If you don’t have a power adapter laying around, you’ll need to get one separately. The manual that comes with the meter is written in Chinese. But there’s no need to be concerned about that because they actually mail you a digital copy of the English instructions when you get the meter. There is also a digital copy of the English instructions on their site. The Proster LCR Meter was made specifically for measuring small capacitance. Because when you’re trying to measure smaller capacitance, measurement methods and frequencies will impact your results. When you’re measuring large amounts of something, a little interference isn’t so bad. But for smaller measurements, a little interference can totally destroy the accuracy of your data. Consequently, the Proster LCR Meter was constructed to measure with higher sensitivity for those kinds of situations. It measures inductance between 200uH-20H with an accuracy up to 2.5%. For resistance you’ll find a wide range of measurement between 200Ω-20MΩ and paired with pretty impressive accuracy around ±0.8%. This LCR meter measures 8.7 x 5.3 x 2.5 inches and weighs about 1.3lbs, making it one of the larger and heavier instruments on this list. The gray and gray chassis probably looks the most professional of any instrument on this list, too. In spite of that, it’s probably the easiest one to use. Because you can do almost everything you need to by adjusting the analogue dial on the front of the device. Beyond that, you there’s only a power button, zeroing adjustment dial, and a single data hold button marked DH. If you hit the DH button, your number will be saved on the screen, placed aside the primary measurement. At the base of the instrument, you’ll find the diode measurement and capacitance test socket. Pretty standard stuff. The display is also fairly simplistic. It doesn’t provide you with a bunch of extra information like the other LCR meters on this list, but it does provide much better readability. That’s partially because the display wasn’t cut into several different parts, and then crammed full of different sets of numbers. Additionally, the display console itself can be physically adjusted to help crane the display upwards. That makes it much easier to view the screen at various reading angles. Though it’s not properly backlit, this is easily one of the more readable LCR meters out there. For capacitance, your range of measurement runs between 200pF-2000uF, with an accuracy of about ± 2.5%. Shorter measurement lines can provide you more accurate measurements, but if you’re using a lengthy line, you might end up near a full 2.5% off. Pretty useful for appliances, factory testing, quality inspection, and so forth. Proster’s meter was built with some common sense features, too. It has an auto power off function and a lower power indicator. That way, you won’t be surprised when your instrument suddenly runs out of battery. All in all, this kit includes the LCR meter, a pair of crocodile clips, a pair of alligator clips, a pair of test probes, a small screwdriver, user manual, carrying bag, and a single 9V battery. Looking for something cheap but functional for sensitive measurements? The Proster LCR Meter is probably your best bet. The quality of its construction is up to par, and the instrument itself is pretty powerful too. It’s far more intuitive than the other options on this list, but it doesn’t have nearly as many extra functions or added features. For measuring faint signals, you can scarcely do better in this price range. 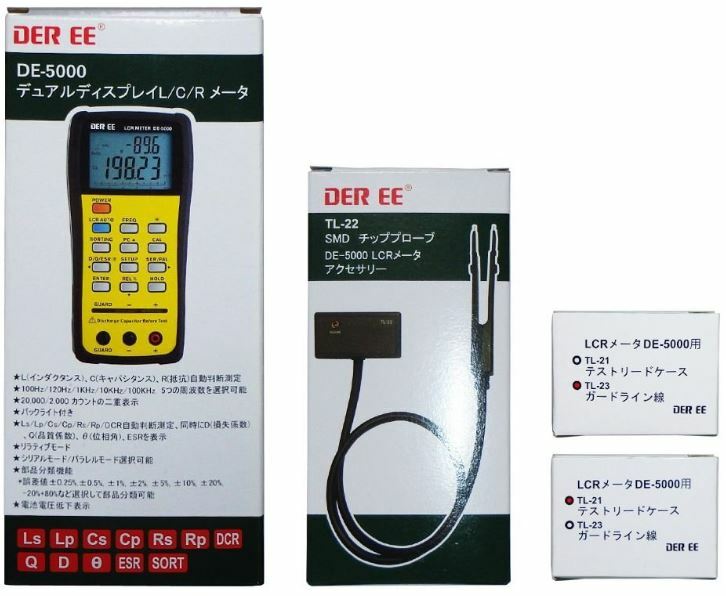 The DE-5000 Handheld LCR Meter is modestly more sophisticated than the Proster LCR Meter. It includes a pretty handy sorting mode. It includes a bundle of extras to ensure you’re ready to start testing anything, and there’s options for future expansion with an IR to USB case. This kit is the right choice for someone who’s looking for a little more depth to their measurements. The Extech 380193 Passive Component LCR Meter might be a bit ugly. But it’s also the most powerful LCR meter on this list. 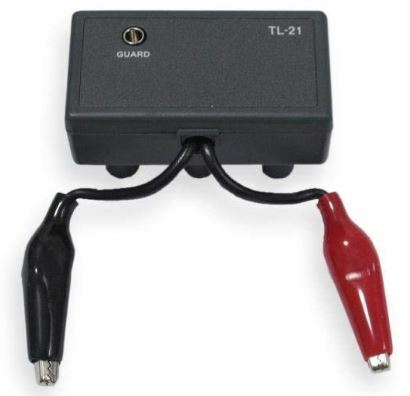 It has special testing leads for contact measurements, or it can be used with external leads. Its accuracy is high enough for a variety of industrial and commercial applications, and those data exporting features really help put it over the top. For someone who needs an LCR meter with all the bells and whistles, the Extech 380193 is worth picking up.